Johnny Cash was one of the most imposing and influential figures in post-World War II country music. With his deep, resonant baritone and spare, percussive guitar, he had a basic, distinctive sound. Cash didn't sound like Nashville, nor did he sound like honky tonk or rock-n-roll. He created his own subgenre, falling halfway between the blunt emotional honesty of folk, the rebelliousness of rock-n-roll, and the world-weariness of country. Cash's career coincided with the birth of rock-n-roll, and his rebellious attitude and simple, direct musical attack shared a lot of similarities with rock. However, there was a deep sense of history – as he would later illustrate with his series of historical albums – that kept him forever tied with country. And he was one of country music's biggest stars of the '50s and '60s, scoring well over 100 hit singles. The recently released The Legend of Johnny Cash compilation is the first single-disc collection to cover the legendary Man In Black's entire career, all the way from the early Sun Records recordings, right down to the American Records recordings he did in the latter years of his life. While it would take literally half-dozen CDs or more to cover every important piece of music Cash has made, this compilation offers the basics and is an excellent overview of his most important and classic work. The legendary Sun Records hits, Cry! Cry! Cry!, Hey Porter, I Walk The Line and Folsum Prison Blues are included here as well as the uncensored version of A Boy Named Sue, Ring Of Fire and Highwayman (Cash’s collaboration with Country legends Kris Kristofferson, Waylon Jennings and Willie Nelson). Also included is Johnny's cameo appearance from U2's 1993 Zooropa album, The Wanderer and to close out the disc, there are several tracks from his American Records series with producer Rick Rubin including an early take of The Man Comes Around and the final hit Hurt (originally by Nine Inch Nails). Trent Reznor's poignant meditation on addiction, is devastating as written, but becomes a thing of terrible beauty in the ailing Cash's ravaged, autobiographical delivery. Sequenced as the final cut on the album, it ends with a kind of shocking void; stunning in its intensity, dropping the listener off a cliff of something very akin to grief. No artist, no matter what genre, could have planned a more haunting exit. The surprise of The Legend of Johnny Cash is how seamlessly the newer material blends with the seminal, and how full-circle it sometimes comes: Soundgarden's Rusty Cage doesn't seem markedly different from the quietly defiant songs that Cash defined himself with in the '50s and early '60s. From his professional musical beginnings right down to his death in 2003, the Man In Black remained musically busy his whole life, never letting old age slow him down. For half a century he dished out the finest country music the world had ever known. Though Cash had his peaks and valleys in the studio, what shines brightly on this collection is how constant – how unwavering – his creativity remained, whether he was writing and performing original material or interpreting the work of others. His voice, too, remained a majestic thing of wonder, even as Cash often sang off-beat; settled his bass-baritone somewhere around, if not on the note; and cared more about power and emotion than strict rules of measure – something that became especially important as illness changed his great oaken voice into a frail instrument. Overall, The Legend of Johnny Cash does his legacy justice. At long last, we have a career-spanning compilation that more than gets the job done. This disk is clearly aiming to appeal to a growing audience – people who are finally ready to buy a Cash disk but don't know where to start. The hits are here, and you really should own them if you care about American music. 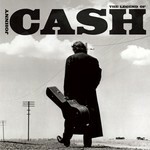 This is probably the best collection of Cash songs to date.